TomTom GO 500 is a top-of-the-range car sat nav which has a 6 inch screen which offers the sharpest image of any TomTom system. The Go 500 comes preloaded with maps of the UK and Europe which are free to update for the lifetime of the product. It also has free lifetime real-time traffic information. The battery life of the device is up to 2 hours. Only the TomTom GO 500 Europe features Speak and Go enabling you to control the device using your voice. The GO 500 offers Advanced Lane Guidance helping you get in the correct lane at each junction. 3D buildings and landmarks helps you further identify on the map where you should be turning. Quick Search aids when you search for your destination. The system also come with 3 months free speed camera database so you will know where all the fixed and average speed cameras are. TomTom GO 500 has been replaced by the TomTom GO 510 (2015) sat nav. Accessories for the TomTom GO 500 new (2013) can be purchased here. The TomTom GO 500 is a top-of-the-range premium sat nav that features a large 6 inch touch screen. The screen provides the sharpest image ever on any TomTom system. It offers pinch to zoom technology, Tap & Go for quick navigation to your destination and it even has bigger menus and buttons to make navigation easier. Plus if you buy the Europe version you will be able to control the device using your voice. 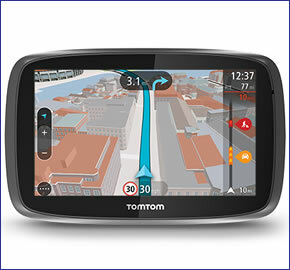 The TomTom GO 500 comes preloaded with European maps with lifetime map updates which includes 45 European countries. These updates include changes to the road network, new addresses and points of interest. The GO 500 also provides real-time traffic information for the lifetime of the product via a smartphone. It will tell you where a traffic jam begins and ends and offer alternative routes. The TomTom GO 500 features Advanced Lane Guidance which will help you at road junctions providing a 3D representation of each junction. The TomTom features 3D buildings and landmarks so you are aided in your navigation by recognising your surroundings on the sat nav. Furthermore IQ routes provides accurate travel arrival times. The GO 500 has Quick search that starts to guess your destination as you start typing. With the My Places feature you can save your favourite locations and navigate to them with ease. Furthermore you can get traffic and speed camera information on your sat nav using Route Bar feature. Speed cameras are free for 3 months. You will receive warnings to fixed cameras and average speed zones as well as know mobile locations. The battery life of the TomTom GO 500 is up to 2 hours. QuickGPSfix ensures your sat nav always finds satellites quickly meaning you can start navigating soon after switching the unit on. Do you have a question about the TomTom GO 500 that's not been answered on this webpage? Please see our car sat nav FAQs for questions from other customers and visitors. Plus if the answer to your question isn't featured, use the online form to ask us for the answer. Alternatively please telephone 01733 777623 Monday to Friday (9:30am-5:00pm) to speak to one of our sales team. TomTom GO 500 has been designed to be a portable plug and play device, and as such can be transferred from vehicle to vehicle with ease by the user. TomTom GO 500 is powered with a 12-volt Compact Car Charger (supplied) and attaches to your vehicles windscreen via the TomTom GO 500 easy click suction cup mount. Additional mounts can also be purchased. Detailed coverage: Andorra, Austria, Belgium, Czech Republic, Denmark, Estonia, Finland, France, Germany, Gibraltar, Greece, Hungary, Italy, Liechtenstein, Lithuania,Luxembourg, Malta, Monaco, Norway, Poland, Portugal, Republic of Ireland, San Marino, Slovakia, Slovenia, Spain, Sweden, Switzerland, the Netherlands, United Kingdom and Vatican City. Looking for genuine accessories and spares for the TomTom GO 500? All parts are genuine TomTom product and specifically designed for use with the GO 500 sat nav. Accessories available to purchase include a travel case, additional mount kit and a weighted dashboard mount.